Tuta absoluta is one of the most devastating pests of fresh market and processing tomatoes. Native to South America, its detection was confined to that continent until 2006 when it was identified in Spain. It has now spread to almost every continent, threatening countries whose economies rely heavily on tomatoes. This insect causes damage to all developmental stages of its host plant, leading to crop losses as high as 80–100%. Although T. absoluta has yet to be found in the USA and China, which makes up a large portion of the tomato production in the world, computer models project a high likelihood of invasion. To halt the continued spread of T. absoluta and limit economic loss associated with tomato supply chain, it is necessary to develop accurate and efficient methods to identify T. absoluta and strengthen surveillance programs. Current identification of T. absoluta relies on examination of morphology and assessment of host plant damage, which are difficult to differentiate from that of native tomato pests. To address this need, we sequenced the genomes of T. absoluta and two closely related Gelechiidae, Keiferia lycopersicella and Phthorimaea operculella, and developed a bioinformatic pipeline to design a panel of 21-SNP markers for species identification. The accuracy of the SNP panel was validated in a multiplex format using the iPLEX chemistry of Agena MassARRAY system. Finally, the new T. absoluta genomic resources we generated can be leveraged to study T. absoluta biology and develop species-specific management strategies. 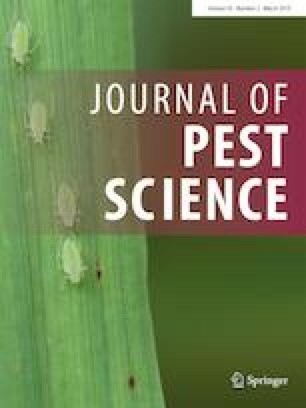 Special Issue on Advances in the Management of Tuta absoluta. The online version of this article ( https://doi.org/10.1007/s10340-019-01116-6) contains supplementary material, which is available to authorized users. We would like to thank Dr. Yannery Gómez Bonilla (Investigator, Entomologia, INTA, Costa Rica) for the samples from Costa Rica, Dr. Phil Stansly (Professor, University of Florida, USA) for the K. lycopersicella samples, and David Haviland (Entomology and IPM Farm Advisor, University of California Cooperative Extension, Bakersfield, CA, USA) for the P. operculella samples. This project was supported by the Specialty Crop Block Program at the USA Department of Agriculture (USDA) through Grant 14-SCBGP-CA-006 to KG, FGZ, and JCC and USDA NIFA CA-D-ENM-2150-H awarded to JCC. Its contents are solely the responsibility of the authors and do not necessarily represent the official views of the USDA. JA and NA are funded by CERCA Programme (Generalitat de Catalunya).